As the weather is getting colder, we did a clothing and shoes distribution today in Tikri. We gave away most of the 'leftover' from the clothes we had received back in March from the Norwegian association Ganpati as well as some of our own daughter's clothes that have become too small for her. Mostly clothes for small children. Our homestay guests Niels and Valeria came along; it was interesting for them and lovely for everyone. We still have a few items to give away and we are planning to go to another nearby village soon. Today Sangeetha Sridhar from Clean India Trail popped into our house to meet us. She saw our poster on our facade and she wanted to interview us about our association's projects! She was mostly interested to hear about our eco-friendly promise, but we talked about the other projects as well. Sangeetha is originally from Tamil Nadu and she lives in Abu Dabi, but she recently left her job to travel round India by car for six months to promote cleanliness in India! We were very impressed to find out more about her endeavours and we dearly hope that her work will (somehow?) help towards educating the local people and getting our environment cleaner! Here is an article about Sangeetha in The Hindu. These beautiful bins are everywhere in the town centre! We have asked for some in the Old village too... Let's see how well they are used and how long they last! School & Cloth Bag Project news! After a long break, The Different School is opening again tomorrow! We did a lot of cleaning in our classroom today and it is ready now. Many of our students have been coming these last few days to ask us when Vio's English class was going to start again, so we are happy to say it will start tomorrow! Mentalities in Khajuraho are not very progressive, shall we say!!! So patience will be necessary. We are currently looking to sell our bags elsewhere in India, but it is not easy. Suggestions are welcome! And if you are interested in buying our bags, please do contact us! Four of Aryan*'s children have started school again, thanks to our partners Ganpati Norway! There is more news about this on their blog - to read it all click on the image below. Thank you so much for all your work Cathrine! 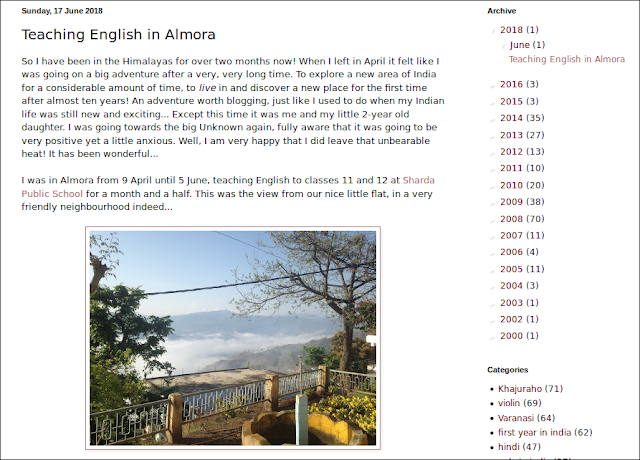 Vio is now in Dharamsala after two months in Almora, teaching English at Sharda Public School. Click on the image below to read a bit about her teaching experience on her personal blog. She will be back in Khajuraho mid July. Three of Aryan's children are starting school again! Big news about our partnership with Ganpati Association and our sponsorship of Aryan's family - three ot Aryan's children will start school again in July! Thank you Vijay for your hard work during these hot, hot months! Click on the image below to find out more about this on Ganpati's blog.